This is truly a remarkable card! 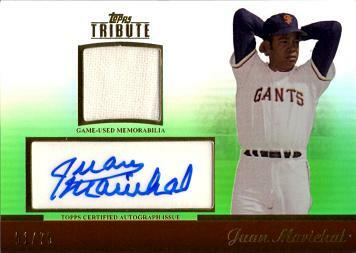 It features an authentic Juan Marichal autograph as well as a piece of game worn jersey that Marichal wore during an official MLB Giants game. The autograph and jersey piece are certfied by Topps. The back of the card reads: "The signing of all Topps autograph cards is witnessed by Topps representatives to guarantee authenticity. 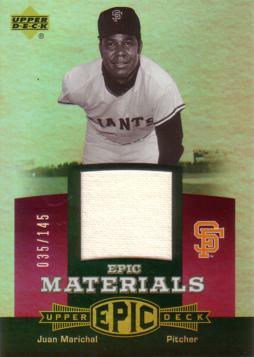 The relics contained in this card are not from any specific game, event, or season."